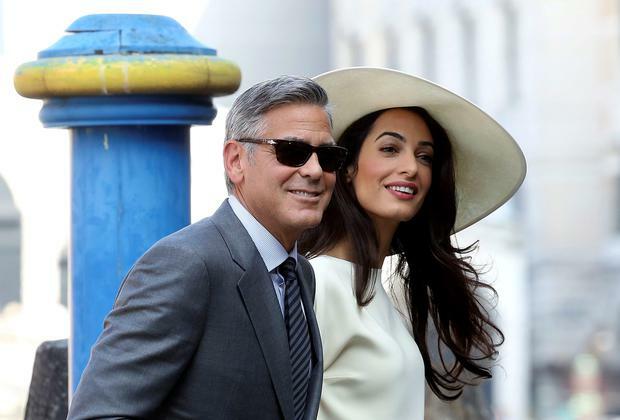 George Clooney, flanked by his wife Amal Alamuddin, arrives at the city hall for their civil marriage ceremony in Venice, Italy, Monday, Sept. 29, 2014. Every man, woman and child with a boat has been out on the water in Venice, straining to get a look at the world's most famous bachelor and the woman who managed to tame him and drag him up the aisle. Hollywood's famous silver fox was finally off the market. Women around the world wept into their pillows, crying over what could have been. George Clooney had finally got married. How? Why? Who? Who is this dark-haired witch who has managed somehow to persuade the suave, debonair Cary Grant-esque actor into matrimony? How dare she? Who does she think she is? He's such a catch. He's so perfect. He deserves better. Hang on a minute. Let's just take a breath and have a closer look at this raven-haired enchantress. Every picture in every paper shows a stunningly beautiful woman with a figure worthy of a supermodel and a mane of thick, lustrous, shiny hair. In every photo she is impeccably stylish, poised and seemingly undeterred by the media frenzy around her. Is she some kind of model? Actress? Celebrity? Surely she couldn't be a 'normal' person. The hottest silver-haired man in the world couldn't possibly be marrying a regular woman. He didn't and she isn't. The supermodel-like woman just happens to be one of the world's most successful human rights lawyers. The 36-year-old beauty, Amal Alamuddin, was born in Beirut. During the civil war in Lebanon her family left and she was brought up in London. She went on to study at Oxford and the New York University School of Law. Since graduating, Alamuddin has not been idle. She has been involved in many high-profile cases and serves as a barrister at Doughty Street Chambers in London. Her specialities include human rights, criminal law, extradition and international law cases. In between brushing her long, glossy locks and applying lipstick to her perfect pout, Alamuddin has represented Julian Assange, the WikiLeaks founder against extradition to Sweden. "Amal is a friend and a lawyer with a global perspective who is not afraid to deal with corruption of power or to tackle politicised cases," says Assange. Alamuddin has also represented Yulia Tymoshenko, the former Ukrainian prime minister, in a human rights claim at the European Court of Human Rights in Strasbourg, and was a member of the prosecuting team in the case against four people accused of assassinating former Lebanese prime minister Rafik Hariri. Her colleague and friend, Mark Stephens, the solicitor who hired Alamuddin to represent Assange says, "She's a fabulously bright woman. She's independent and has a Rolls-Royce mind with intersocial skills to die for." When she's not eating salads, Alamuddin - who speaks fluent French, Arabic and English - is also busy as counsel to the Inquiry led by UN Special Rapporteur on counter-terrorism and human rights into the use of drones, and working as an adviser to Kofi Annan, the Joint Special Envoy of the United Nations and the Arab League on Syria. So she's not just a pretty face. Alamuddin is, in fact, a dazzling woman who is saving the world while making Hollywood's most eligible bachelor fall madly in love with her. You'd have to wonder what she does in her spare time - design space ships? She'll certainly give Clooney's best friend, Angelina Jolie, a run for her money. Imagine what those two raven-haired beauties could achieve together. They could probably right all the wrongs of the world. To be fair to Clooney, he, at least, is aware of how lucky he is. He has stated publicly, "I'm marrying up". Ever since news of the engagement broke, the media has been talking incessantly about how Alamuddin managed to "tame him", "pin him down", and "make him marry her". It certainly looks as if Clooney has met his match and more. Mind you, Alamuddin will need all of her steely determination and backbone to deal with the intense media focus that she will endure. Every time Clooney goes out alone, the tabloids will speculate on the state of their marriage. Every time Alamuddin has a slice of toast, the media will announce that she's pregnant. Her husband's best friends include supermodel Cindy Crawford as well as Angelina. You wouldn't want to be short and dumpy in that company. Luckily for Alamuddin, she's as gorgeous as she is intelligent. He holds two Sexiest Man Alive titles and a pair of Oscars but George Clooney's new wife is the real prize.